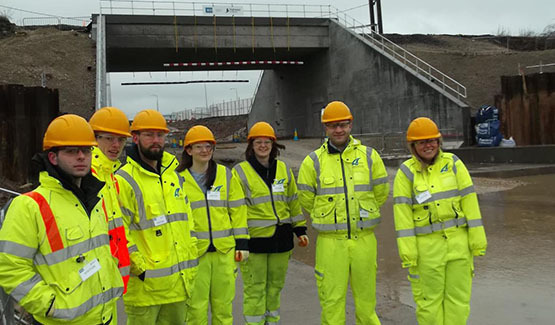 A visit to a major construction site on the A160 was arranged for our Civil Engineer Apprentices and developing Technicians and Engineers. This was a good opportunity to see the development of major works within the local area. This visit was arranged as part of the ongoing development of staff within the organisation. It was a good opportunity to gain an insight and understanding of construction operations. The visit was split into a presentation, followed by an escorted visit to specific areas of the site. The presentation gave an overview of the site as a whole, discussing the difficulties and ongoing communication with neighbouring houses and businesses which are affected by the works. We were shown plans of the proposals for the project, including new interchanges, construction of a dual carriageway and construction of new bridges. This project is one of the lead contracts in the country to successfully implement the Building Information Modeling (BIM) system. During the presentation we were given a brief overview of some of the functions of BIM, and how it has been implemented within the project to improve asset management. Extensive details about each asset are stored on BIM to provide details for the full life cycle of the assets, including lighting column outages, supplying details for maintenance and, once the asset is life expired, details for removal. Through this activity, our workforce has been given an insight into the workings of a major construction site, helping their appreciation and learning.